Ethel Chia with a child from the nursery. Last month, the city of Derby served as the honorary home to three childcare practitioners all the way from Singapore. 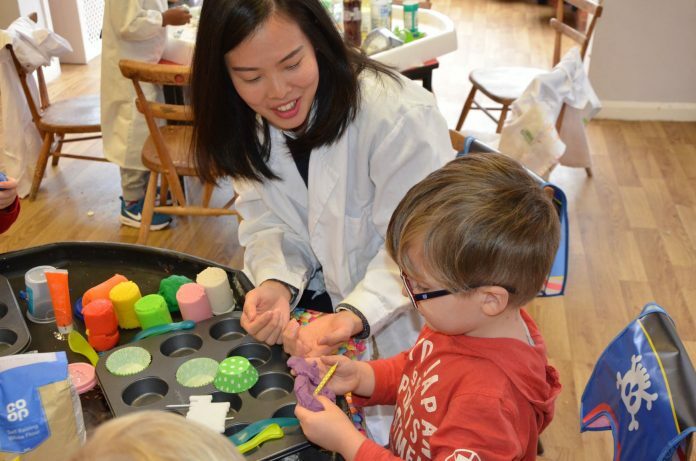 Busy Bees at Treetops Silvertrees invited its international counterparts to spend time at their nursery as part of Busy Bees’ third Talent Exchange Programme (TEP), with the aim of sharing skills, expertise and knowledge across cultures. Beatriz dela Cruz, senior teacher at Brighton Montessori, Widya Alwi, teacher at Pat’s Schoolhouse and Ethel Chia, curriculum specialist at Odyssey Global Preschool, travelled almost 7,000 miles to take part in the three-week exchange. The nurseries in Singapore were part of an acquisition by Busy Bees of 83 nurseries across Singapore and Malaysia in early 2015. Claire Phizacklea, Chief Talent Officer said: “As Busy Bees has grown and expanded into new countries, it has given us the opportunity to explore similarities and differences in practice from across the world. Busy Bees cares for more than 50,000 children in over 500 settings across the globe, including Singapore, Malaysia, China, Australia and Canada.